If you have never seen one of these pancake lens designs before, you’d be forgiven for thinking it is an adapter rather than a Prime lens. At only 22mm thick, the lens features the first ‘STM’ type motor from Canon, which has the advantage of being both smooth and quiet, which is ideal for video and even mirrorless designs. A 40mm focal length may seem an odd choice as most standard focal lengths are at 35mm and 50mm, but to some, 40mm has a more natural view. This may be debatable, but at least the options are out there to fine-tune your own standard focal length. Coupled with ultra-compact design and relatively cheap price, this could be one of the go-to lenses if you wanted a small and fast prime which is great value for money. Below we will see if the lens measures up these claims, especially against Canon’s own entry-level EF 50mm f/1.8 II which is usually the go-to affordable prime lens. For such a flat looking lens there is still plenty of glass included to produce good results. 6 elements in 4 groups and 1 aspherical element are found internally with seven rounded diaphragm blades. Aperture range goes from f/2.8-f/22, with a minimum focusing distance of 0.3m. The front filter thread is 52mm and doesn’t rotate when focusing, with a Linear Stepper Motor(STM) added for good measure. The whole lens weighs a meager 130g making it ultra compact and lightweight. Optional extras include the ES-52 screw-in metal hood which may be needed in very bright or direct sunlight. You can use any 52mm thread screw-in hood on this lens, which actually looks quite cool looking like you just have a large hood and adapter on your camera body. The lens also works perfectly well on a APS-C sensor body, having an equivalent focal length of 64mm and acting more like a short telephoto lens. The EF mount is also designed to fit on an EOS M with an adapter. The mount itself is made of metal and the barrel made of the same solid plastic as the EF 50mm f/1.8 II, but the 40mm definitely feels like a more quality product. Being so flat, you can’t exactly fit in many features, so you just get an auto and manual switch and a thin 4mm wide focus ring which works very smoothly. On a large DSLR body, you’ll hardly notice the weight of this lens and on smaller DSLRs, the combo couldn’t feel lighter. A definite back saver when you’re carrying around your camera all day. Autofocus using the Stepper Motor STM is extremely quiet and although it isn’t as fast as USM, it still works better than the micro-USM version. Speed of focusing drops dramatically in Live View, but on the flip side, the manual focus is electronically-driven by the camera like on a mirrorless camera. This can allow much smoother manual focusing also in Af mode and is a definite jump up from how the 50mm f/1.8 II operates. However, you have to keep the shutter button half-pressed and the camera switched on for the focus ring to work manually. The lens has very good central sharpness when wide open and carries on up to f/11. There is some softness in the corners when wide open, but stopping down a little removes the usual distortion and chromatic aberration. In this respect, sharpness is on a par with the EF 50mm f/1.8 II. Similar results can be found on a crop sensor body, with only slight vignetting found in the corners. Being such a thin lens, flare can occur if you’re shooting into bright light, which means one of the hood options would be needed. The lens also handles color fringing very well, with hard-edged subject matter against bright backgrounds being minimal and easily reduced with postprocessing. Having a wide f/2.8 aperture means you get reasonably good background blur or bokeh. It may not be as good as what you see from a longer lens or one that goes as wide as f/1.4 or f/1.8, but the blur is pleasing enough for most situations looks very natural. Resulting images are actually better than you would expect with the only real downside is that it may not be as fast as an f/1.8 or f/1.4. That’s really down to the lens’ overall small dimensions, you can’t have it all at this price point. For such a small piece of lens, the optical quality is better than expected. Sharpness is very good across the frame with only small amounts of vignetting when wide open. As per the usual mantra, this is easily rectified in post-production. Lens flare can also creep in if you’re not careful around bright light, so it’s advisable to buy a small hood and keep it on most of the time. The STM focus motor works quietly and this will be an advantage to video recording, but also focus is usually quite slow, especially in low light conditions. The motor is interesting to work with being camera controlled, and the manual focusing is especially useful when you camera is on a tripod. As far as use on an APS-C goes, the increasing focal length to 64mm will be better suited as a complement to other zooms and primes. 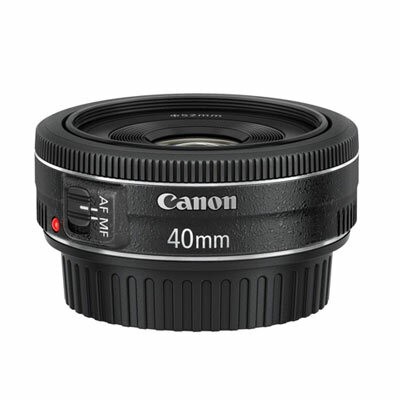 On a full frame sensor, the 40mm can act as a good general-purpose, standard prime especially on higher end bodies. One pertinent question would be how well it matches up overall against the EF 50mm f/1.4 USM. If you want the lightest and most compact lens and not too bothered about ultra shallow depth of field, then the EF 40mm f/2.8 STM would be a good choice. If your budget is around the same and you want that extra shallow focus, then the EF 50mm f/1.8 II would suit better with roughly the same optical qualities, but it does only have a five blade diaphragm, which will give less rounded highlights. For the price, you really can’t fault the EF 40mm F2.8 STM as it gives sharp images, nice background blur and couldn’t be more compact in size. It’s not the fastest lens in the world, but it would definitely be a nice compliment to existing zooms and prime lenses in your arsenal.